Just like last time, I sent two boxes of books from New York. They took about $60 and almost exactly two months to get here. This time, I mailed them to Don's office address rather than here, in hopes they would arrive with less hassle. Well. The books didn't go to Don's office, but instead, Don got a handwritten letter saying that he needed to pay 30 rupees a box as a "bulk mailing fee." This was fine, although I don't really understand why my New York City post office didn't know the right amount of postage to put on. Was this a fee a unilateral decision by the Museum Road branch of the post office? I don't know. Off I headed to the post office. I managed to pay the 60 rupee fee and to locate the books without too much trouble -- they were in the PO's basement, in an office next to a couple other random packages. The next problem was convincing the clerk to give me the books even though they were addressed to Don. Since I was the mailer (but not the mailee), it ended up being OK. And then I discovered that one of the boxes inside the heavy plastic M bags had burst in transit. 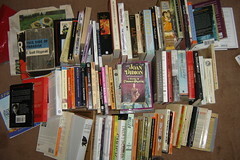 So I had a bunch of books sloshing around in a bag. It would have been easy if I could have kept the boxes in the bags, but I needed to give both bags to the post office, and the clerk (and the postmaster, who she called) wouldn't trust me to bring them back tomorrow. (Why did they need the bags? According to the clerk, to get the USPS to reimburse them for postage). After standing around for a while packing all the books I could into my gym bag and making a pile of the rest, I wore down the nice clerk, and she gave me a spare box to get them home. Now I only have to find the time to read them . . .
You have an excellent creative approach and narrative style. Evidence based librarians look for such stories.